Join us for a rich mix of performances and events complementing the Olympic and Paralympic Games. 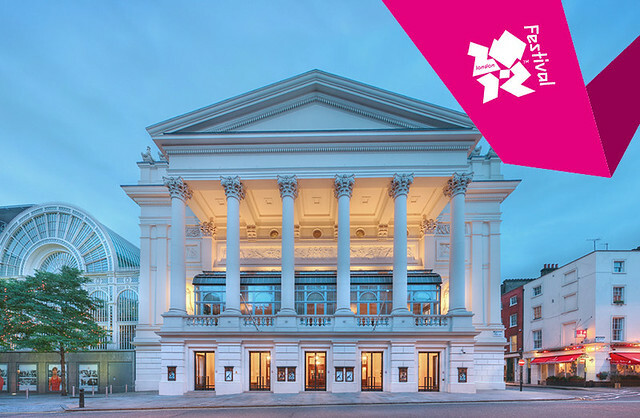 This summer will see an explosion of over 1,000 arts events around the UK, and the Royal Opera House is hosting some of the highlights of the London 2012 Festival. As well as major operas, new dance and music on London’s waterways, we're holding a major exhibition focusing on the history of the Olympic Games. Our network of BP Summer Big Screens will bring two of the London 2012 Festival productions to over 20 locations around the UK, ensuring that as many people as possible can share the excitement of free opera and ballet in 2012. A lavish new production of Verdi’s Shakespearean comedy, directed by Robert Carsen. This opera is part of the World Shakespeare Festival. Antonio Pappano conducts our classic production of Verdi's opera based on Shakespeare’s tale of love and jealousy. This opera is part of the World Shakespeare Festival. An epic new staging of Berlioz's opera about the rise and fall of empires, directed by David McVicar. The Royal Ballet present a new work inspired by three Titian paintings, in collaboration with the National Gallery, London. Choreographers, artists, musicians and poets will come together to create a truly remarkable event. We celebrate Operalia, the international vocal competition, founded by Plácido Domingo in 1993 to help launch the careers of the best young opera singers. A remarkable cast of singers join Placido Domingo and Antonio Pappano for a one-off event. A one-night festival celebrating the artistic skills of performers from the UK and abroad who have experienced homelessness. The event is presented by arts and homelessness charity Streetwise Opera. The Owl and the Pussycat during the summer of the Games. Featuring a libretto from ex-Monty Python Terry Jones, a new commissioned score from critically acclaimed musician and Oscar-winning (The Full Monty) composer Anne Dudley and directed by Martin Constantine it promises to be an event like no other. This new short opera, directed by Martin Constantine, bridges both the water and the banks along London’s canals and waterways, with performances at various points as it travels from West to East. This exciting new work is part of the 'Secrets' programme and will be one of the highlights for the London 2012 Festival. Mayor of London presents 'Secrets', a series of extraordinary site-specific collaborations taking place in a range of hidden spaces across the capital in summer 2012, led by major artists and leading cultural organizations. A very special exhibition presented by the Royal Opera House, BP and The Olympic Museum. Including Olympic Torches and Olympic Medals, this free exhibition will celebrate the achievements of ancient and modern Olympians.